Edit an existing article: spelling, formatting, give it a new name, etc. Editing an article in Feed.Us is pretty straightforward. From the dashboard, you'll see a list of recently added documents. 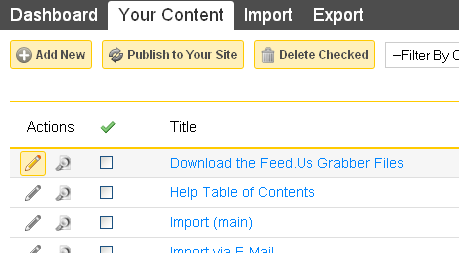 Or if it isn't so recent, you can click the "Your Content" link. This will load a list of the 10 most recent documents. There are links at the bottom of the page to list the older docs. You can also use the search field or filter by category at the top of the page. Unfinished content is in its own corral called "Drafts". Click the "magnifying glass" to view the document. Click the name or the "little pencil" to edit the document. When the page loads, you'll see the fields that you can edit (like "Title", "Body", etc). Make edits and be sure to save. Don't forget to publish your changes!